A leaf in the forest gives a sign that fall has come in Canada as this leaf can be seen in the forest along the road to Rock Lake in Algonquin Provincial Park, in Ontario Canada. When it gets cold and the weather changes the leaves fall from the trees. Fall has definitely come to the forest along the road to Rock Lake in Algonquin Provincial Park in Ontario Canada, as the bright red of this leaf here can be seen in stark contrast to the white of the fallen tree trunk it has landed on. The forest in Algonquin Provincial Park is hundreds of years old and is Canada's oldest provincial park. It is also the only provincial park that still allows logging within its boundaries. Algonquin Provincial Park has a lot of old-growth forest in it and that can be very valuable so logging has to be monitored closely so that the forest doesn't die out. 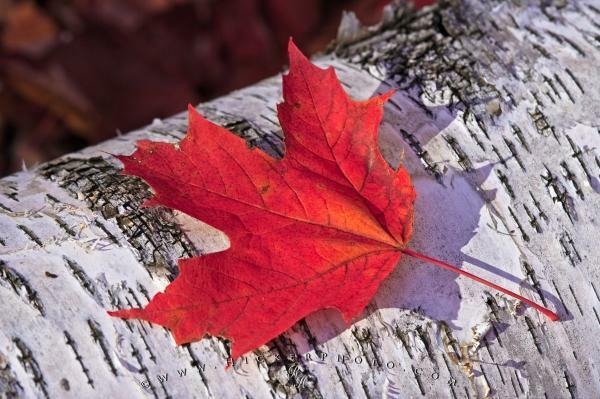 Photo of a Fall leaf in the forest along the road to Rock Lake in Algonquin Provincial Park, Ontario, Canada. ... It is a wonder of nature how the leaves know that fall is coming but as the days get shorter and there is less light and food, the leaves are forced to live off the stored energy from summer. It is the chlorophyll disappearing from the leaves that make them turn from green to red, yellow or orange, and depending on the type of tree the leaves will turn different colours. Leaves are meant to fall from the trees each year, except for the trees that don't do that of course, so that they can return to the earth and provide nutrients to the soil that will help the tree continue to grow throughout the winter and into next spring and summer. It is usually the cold weather that makes the leaves fall but they will fall each year around the same time regardless of how cold it is. I photographed this photo with the digital SLR camera model Canon EOS-1Ds Mark II, aperture of f/9.0, exposure time of 1/60 sec. on ISO 100, as always I used a original Canon Lens, the focus lenght for this picture was 180mm.